To honor its recent selection by Golf Digest as one of the “World’s 100 Greatest Golf Courses,” Quivira Los Cabos is offering a “Taste of the Top 100” package to celebrate the prestigious award. For the third consecutive year, Quivira Golf Club has received an Editors’ Choice Award for Best in Travel 2018 in the May issue of Golf Digest. Quivira Golf Club, the epic Jack Nicklaus-designed course set along the mesmerizing seascape at the tip of the Baja Peninsula, has been selected as one of the World’s 100 Greatest Golf Courses by Golf Digest magazine. This is a taste of what was Sabor a Cabo 2017 at Quivira Los Cabos. For the second year in a row, Quivira Golf Club has received an Editors’ Choice Award for Best in Travel 2017 in the May issue of Golf Digest. To celebrate Quivira Golf Club and its Jack Nicklaus Signature Golf Course as “Best New International Golf Course” by Golf Magazine, Pueblo Bonito Oceanfront Resorts and Spas has introduced a series of “Play More & Save More” golf vacation packages that showcase the resort’s world-class golf facility, combined with deluxe accommodations. Quivira (pronounced key-vee-ra), the exclusive 1,850- acre development at the tip of Baja California Sur in Los Cabos, has garnered another prestigious award. Golf Inc., a revered golf industry publication, has cited Quivira as the “2014 Development of the Year,” honoring the $40-million Jack Nicklaus-designed layout and community with a first place award as the world’s finest golf facility opened last year. 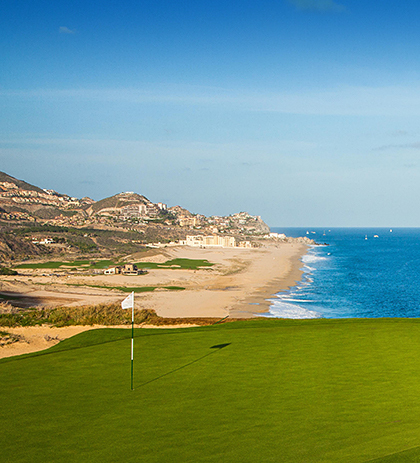 Quivira Golf Club, the stunning new Jack Nicklaus Signature Golf Course recently unveiled at the tip of the Baja Peninsula in Los Cabos, has been selected as the “Best New International Course” of 2014 by GOLF Magazine in its January 2015 issue. To celebrate the Oct. 1 debut of Quivira Golf Club, the Jack Nicklaus Signature Golf Course that is poised to redefine the Cabo golf experience, Pueblo Bonito Oceanfront Resorts and Spas has unveiled the ‘Ultimate Golf Package’ for travelers who demand the best….and only the best! In a dramatic setting at the tip of the Baja Peninsula, marked by windswept dunes, sheer cliffs and desert foothills 10 minutes from downtown Cabo San Lucas, Jack Nicklaus has crafted a golf course that is poised to redefine the Cabo golf experience. Quivira Golf Club is the centerpiece of Quivira, the newest luxury development in Los Cabos, which encompasses two resorts—Pueblo Bonito Pacifica Resort & Spa and Pueblo Bonito Sunset Beach Resort & Spa—and three high-end real estate communities: Montecristo Estates Luxury Villas by Pueblo Bonito, Copala, and Novaispania Residences. Homefront Magazine: "A Crown Jewel with an Off-The-Chart WOW Factor"
San Diego Union Tribune: "Rounds are Long, Scenic at Los Cabos' Quivira Golf Club"
Flagstick Golf Magazine: "Living The Golf Life In Mexico"
LINKS Magazine: "Quivira Golf Club - Los Cabos, Mexico"
JetSet Magazine: "Quivira Los Cabos: The Ultimate Destination for Refined Living"
Golf Trips: "Looking for Real Estate in Quivira Los Cabos? Atlanta Journal-Constitution: "Traveling in Summer: 8 Ideas for where to go"
The Province: "Golden Bear Leaves Mark in the Baja"
Golf World UK: "Bucket Lister - Quivira Golf Club"
FlightNetwork: "22 of the World’s Best Luxury Honeymoon Destinations in 2017"
Golf Business: "On the Right Path"
Forbes: "Quivira Might Be Mexico's Pebble Beach, With 18 More Holes Of Great Golf On The Way"
In Mexico: "Dream Resorts The Top of Mex Awards"
SoCal Golf Insider: "Pure Paradise"
Arizona Fairways Magazine: "Quivira Los Cabos Stay, Play & Live!" Golf Features: "The Nicklaus Influence"
Square Mile: "The Most Beautiful Golf Courses on the Planet"
Great Golf: "Quivira Golf One of Mexico's Best"
Golf Vacation Insider: "Quivira Golf Club: The Pebble Beach of Mexico"
Minnesota Golfer: "Nicklaus in Nirvana"
Haute Living: "Quivira: The Quintessential Cabo Experience"
Southern Golf Central: "Experience Quivira!" Examiner.com: "Quivira Golf Club - A Wild Ride on the Pacific Side of Baja"
Colorado Avid Golfer: "A Cabo Cliffhanger"
Ideal-Living: "Azure Seas and Stunning Sunsets Discover the Coveted Los Cabos"
New York Lifestyle Magazine: "Paradise Discovered"
Travel Industry Today: "Jack Nicklaus designed seaside sensation in Los Cabos"
Local Golfer: "Top Golf Course in Cabo San Lucas: Quivira Opens To Acclaim"
Golf Digest: "Jack Nicklaus on how to play hole 5 at Quivira Golf Club"
Colorado Avid Golfer: "Between Rocks and Waves"
Cigar Aficionado: "The Golden Age of Nicklaus"
World Property Journal: "Great Golf Resort Communities of 2015 Revealed"
Golf Inc Magazine: "Quivira Golf Club first Latin American Course to take top honors as 2014 Development of the Year by Golf Inc"
Golf Inc: "Recognizes Three Nicklaus Design Layouts as Development of the Year Honorees"
Golfweek Golf Life Extra: "5 Great Winter Golf Destinations"
Global Golf Post: "Nothing But Playtime"
GolfScene Magazine: "Quivira Golf Club"
Golf Magazine: "Best New Courses of 2014"
Shiels: "Cabo is a golf haven"
Golf Advisor: "Golfers Should Celebrate Jack Nicklaus, the guy who ruined Cabo"
Travel Golf Mexico: "Quivira Golf Club in Los Cabos: Nicklaus scores again"